Well, I started this "12 Weeks of Christmas Cookies" with some gumdrop cookies, and I thought it would be nice to end up with another variation of a cookie involving gumdrops. This was the recipe I was hunting for originally and then realized it was tucked away in the garage in one of my Christmas boxes, so made the other recipe, which is quite different from this recipe. I'd like to extend a big THANK YOU to April of Abby's Sweets for hosting this fun, supportive cookie group! I have really enjoyed getting to know so many wonderful baking bloggers and picking up great cookie recipes along the way! These gumdrop cookies live up to their name. The very centers are a bit soft, yet the edges are crispy, sugary, melt in your mouth goodness! I used the "Spice Drops" version of gumdrops, which added a bit of zing to the bite:) Right after baking, the drops are also softer and chewier, which complements the crisp cookie. Sugar Crispies would be a delicious, colorful addition to any cookie platter! Cream together shortening, sugar, eggs, oil, salt and vanilla. Sift all dry ingredients and add to creamed mixture. Roll into one-inch balls and roll in sugar. Press on gumdrop in center of each cookie. Bake at 350 degrees for 10 minutes. Yield: 8 dozen. and All Through the Year Cheer . I just love these and how colorful they are! What a perfect addition to our Christmas cookie trays they will be!! Oh beautiful, Sue! I have enjoyed baking along with you this year! Happy Holidays! These cookies do look absolutely fun and delightful. 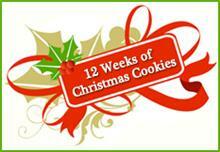 I've enjoyed seeing all your cute cookie ideas these past 12 weeks. Merry Christmas. So whimsical! These are perfect for a Christmas cookie platter. Merry Christmas to you & your family! Love these! They look like what a Christmas Cookie should look like. I have enjoyed all 12 weeks with your cookies. Can't wait to see what you make next. They look yummie, but your description is what has me going! I love a soft chewy cookie and the spicy gumdrops would really do it for me. We didn't get around to cookies this week and now I feel badly! Have soooo enjoyed checking out all your cookies and these are no exception! They look so Christmasey and delicious! I've never seen a cookie recipe with this combination of fats before. I'm very curious about the texture. Sounds and looks great. It's been fun following these fun treats. These look really cute .. thanks for sharing. How colourful! They will be perfect for Christmas! Merry Christmas! These are so pretty and colourful! Perfect for the festivities! i love them! I love the gumdrops. So festive! Such a lovely way to use gumdrops in a cookie! I actually have some laying around the house right now! The spice gum drops are a good call. I can imagine how yummy that bit of zing is with each sugary bite. You have featured so many wonderful cookies this year. Thank you for all of the great ideas!! seems like everyone's baking up a storm! i need to get myself in there and bake some holiday cookies now. your sugar cookies are adorable! Such a cute and colourful cookie for the season. Hoping you had a lovely Christmas. All the best to you in 2011.
thanks for sharing, I do a lot of baking to send to my children & grandchildren and I'm always looking for new recipes. Merry Christmas.